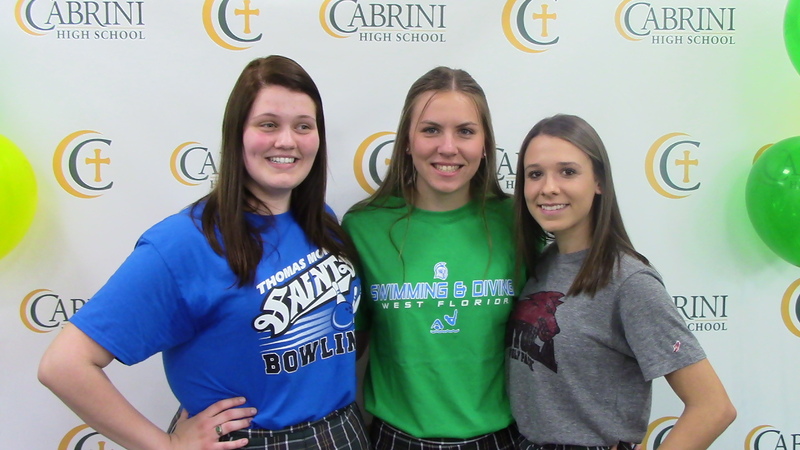 NEW ORLEANS – Three of Cabrini High School’s elite athletic performers in the Class of 2019 finalized their college decisions Thursday afternoon in an on-campus ceremony. Cross country runner Madisyn Acosta is headed across town to Loyola University, swimmer Kathryn Mipro has signed with the University of West Florida in Pensacola and bowler Jaya Jensen will attend Thomas More University in Crestview Hills, Kentucky. Acosta, who didn’t begin distance running until after her sophomore year, won the District 10-4A meet each of the last two years, leading the Cabrini team to the district title both seasons. She finished seventh in the Class 4A state meet in November in Natchitoches as the Crescents placed third. Loyola cross country and track coach Kevin Licht was on hand for the ceremony. Mipro, who earned All-District honors every year since eighth grade, was a five-time state champion in the pool. In addition to relay titles for the Crescents, Mipro swept titles in the Division III 50 and 100-meter freestyle as a junior and finished third in both events as a senior. Jensen capped her high school bowling career last Friday by finishing third in the girls singles event of the LHSAA championships in Baton Rouge.